Lapins are a large, firm, dark red crunchy cherry with a delicious flavour. 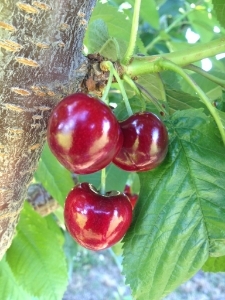 This variety of cherries are harvested usually after the lapins in the Creston Valley. They are a great tasting cherry, although they are not quite as large as the lapins. The harvest start dates for the staccato is usually around Aug 12th to the Aug15th in the Creston area. The fruit are very firm, large, sweet, and attractive. This is our earliest cherry, it is very sweet, large, firm and great tasting. This cherry is golden yellow with a red blush, and the flesh colour is clear, and tastes superb.